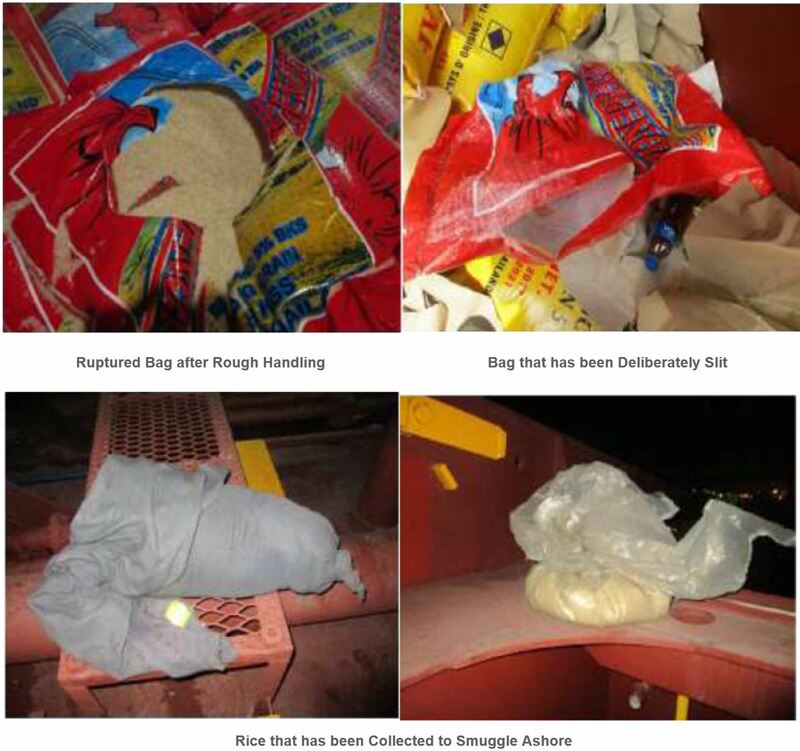 The Club continues to receive frequent shortage claims involving bagged food cargoes (rice and sugar are those most commonly affected) being discharged in West African ports. Food is attractive to pilferers as it can easily be removed from a vessel either for consumption, for gifting to others or for sale. Bags often weigh up to 50kg and are consequentially difficult to manually handle. Stevedores therefore make up sling loads in the cargo hold wings which are then dragged over the top layers of the stow to the square of the hatch with resulting damage to and spillage from the bags. Shore winchmen deliberately causing slung bags to rupture by hitting the load against the hatch coamings when lifting from the cargo holds. Bags are deliberately slit or holed by the stevedores using hidden blades / knives, or by the use of stevedores’ / dockers’ hooks. The resulting spillage is then collected by stevedores to fill small containers and bags, which they then attempt to smuggle ashore at the end of the day’s work. Assign a crew member to observe operations – one per each working hatch, so far as manning and compliance with hours of rest regulations allow. The duty deck officer should maintain a roving patrol of the cargo operations, visiting each working hold frequently. Anyone seen inside a cargo hold, or on deck who does not appear to be a stevedore should be asked to leave. If theft is observed – tell them to stop and inform the stevedore foreman. If it can be done discretely, take photographic evidence. Overt photography should be avoided to prevent the stevedores becoming agitated. Issue Notes of Protest to all concerned parties. Employ reliable private security guards, dogs can also be a useful deterrent. Local correspondents will be able to recommend reliable service providers. Instruct a protective surveyor to monitor operations. Shut and secure all cargo spaces not being worked. Should pilferage begin to escalate out of control, the vessel may threaten to close the hatch covers and suspend cargo operations until all parties agree an appropriate course of action. However, such a step should not be taken lightly and both owners and the local Club correspondent should be consulted first. If it is necessary to halt cargo operations due to pilferage, the stoppage should be kept to an absolute minimum as the port authority may order the vessel to vacate the berth if there are other vessels waiting to discharge, and / or they may impose a fine for occupying a berth while idle.